Budget Crunching: Richmond Debate Turns to Poverty, Event Spaces and More | News and Features | Style Weekly - Richmond, VA local news, arts, and events. This is it, Richmond -- the many, many moments you’ve been waiting for. On Monday, from 11 a.m. until 4:30 p.m. -- that’s 330 minutes -- City Council members presented the first of their amendments to the mayor’s proposed fiscal year 2018 budget. They agreed on cuts of $1.19 million out of $681 million. Minus a 20-minute break, that’s $3,845 a minute. But to find the money for all $19,109,723 of increases the members have proposed, that’s another 4,660 minutes in council chambers -- 77 hours of fluorescent lighting and poor lumbar support. Luckily, the meetings themselves aren’t a math problem. They’re an intimate look at city budgeting and the priorities of the people elected to spend taxpayer money. It’s worth paying attention to. But here are some takeaways from Monday if you aren’t inclined to spend hours watching the proceedings. 1. 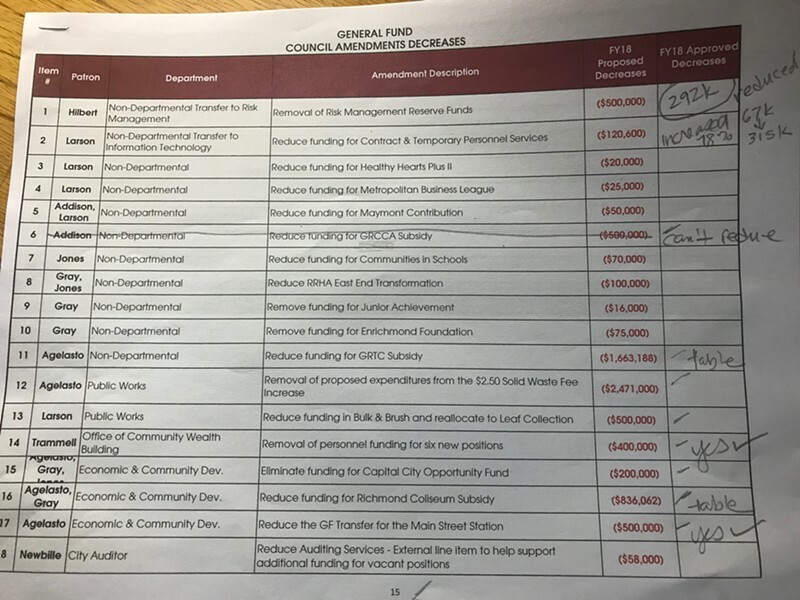 Despite a plea from council president Chris Hilbert to pair increases with cuts, there are only about $8.29 million of proposed cuts to the general fund budget -- versus the $19 million-plus in increases. It would be difficult to determine who’s most guilty of the crime of unbalanced proposals, because of amendments with co-patrons. 2. Councilman Parker Agelasto has proposed the most increases, totaling about $5.29 million. But he also is patron or co-patron of some of the biggest cuts, totaling a little over $5.67 million. It’s safe to say that Agelasto was the least pleased with the mayor’s proposed budget -- at least based on the dollar amount of changes. 3. Agelasto’s second-largest proposed cut was of $1.66 million to the GRTC Transit System. It amounts to flat funding for GRTC, Agelasto said -- not a reduction. And he wanted council to urge Virginia Commonwealth University to cut its student buses and return to contributing $2 million a year to GRTC. The transit system’s chief executive, David Green, said this would be the third year of flat funding, and the cut would affect the Pulse bus rapid transit project and new routes planned around it. “I would caution council about taking an action based on the assumption that VCU’s bus service would be eliminated,” city attorney Allen Jackson said. The discussion of the proposed cut was tabled. 4. For now, amendments are approved with a simple consensus, and it’s sometimes difficult to follow who’s voting for what. “I want to emphasize that this is a fluid process,” council vice president Cynthia Newbille said. Final decisions on amendments will require five recorded votes. If the mayor vetoes any amendments, they’ll need six votes to override the veto. 5. The two biggest increases -- and the ones with the most co-patrons -- are $1.1 million more for fire and emergency services and $1.61 million more for the police department. Cuts on Monday didn’t quite get halfway to the number they need for those funding increases. But that didn’t stop Councilwoman Reva Trammell from cheerleading for the extra police funding more than once. She held Reggie Gordon hostage at the dais for a while, comparing the importance of his Office of Community Wealth Building’s efforts to those of the police force. 6. Trammell also called up Police Chief Alfred Durham to remind the council of rising homicides. And in addition to that, Durham said, non-fatal gunshots already stood at 54 this year, including a 7-year-old shot in Mosby Court over the weekend. There were 41 last year. 7. Speaking of Gordon, there was an interesting debate concerning his department with implications for how a city combats poverty day to day. Mayor Stoney wanted to hire six new workforce development staffers at $400,000 to help low-income people find jobs and services. But, as councilwoman Kim Gray noted, the mayor had concurrently cut some of the very services that people use to get out of poverty. Council voted to cut those positions for now. 8. Councilman Andreas Addison tried to take $500,000 of the lodging and hotel tax from the Greater Richmond Convention Center Authority, which is projected to get $8.03 million from the tax this year -- the entirety of it. That was shot down. It’s one of those pesky contracts or agreements the city has hanging around. 9. Speaking of which, the second cut of the day came from the mayor’s proposed $1.7 million subsidy of the Main Street train shed renovations. Council members didn’t appreciate a plan to subsidize the operating losses of the shed, projected by Economic and Community Development Department, for the next five years. They voted to lower the number by $500,000, which the city said would have gone to security and commercial kitchen installations. But concern about such city subsidies was strong. “As a taxpayer, it’s very difficult to conceptualize that we’re supporting so many public event venue investments but we don’t have enough revenue to pay for basic facility needs or salary increases and stuff like that,” Gray said. 10. 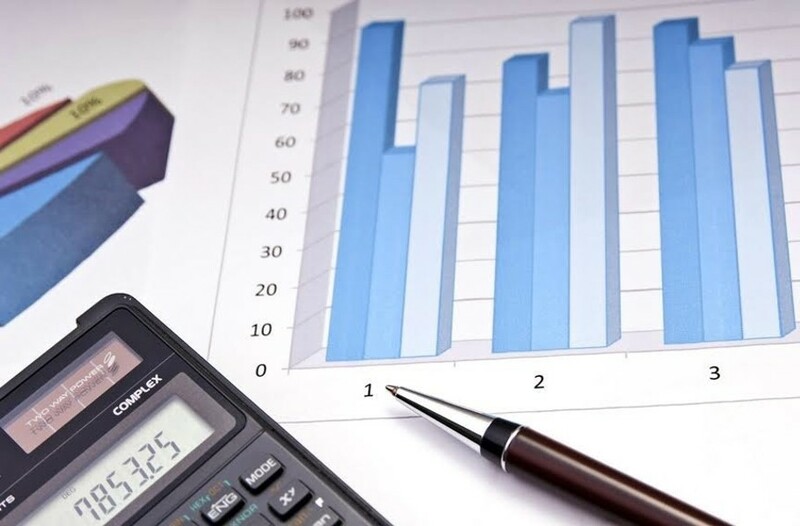 The third cut: Council found $292,000 by lowering risk management reserve funds. 11. It’s open season for sending money to that neat little organization you know the director of. The amounts are smaller, but most of the amendments proposed were “non-departmental” -- nonprofits and initiatives with missions near and dear to councilmen’s hearts. - $117,300 in additional funding to CultureWorks. - $600,000 additional funding to Venture Richmond. - $180,000 to the performing arts companies at CenterStage Foundation. The mayor’s budget already had about $4 million in such line items. Amendments propose adding a few million more. Budget work sessions continue Monday. 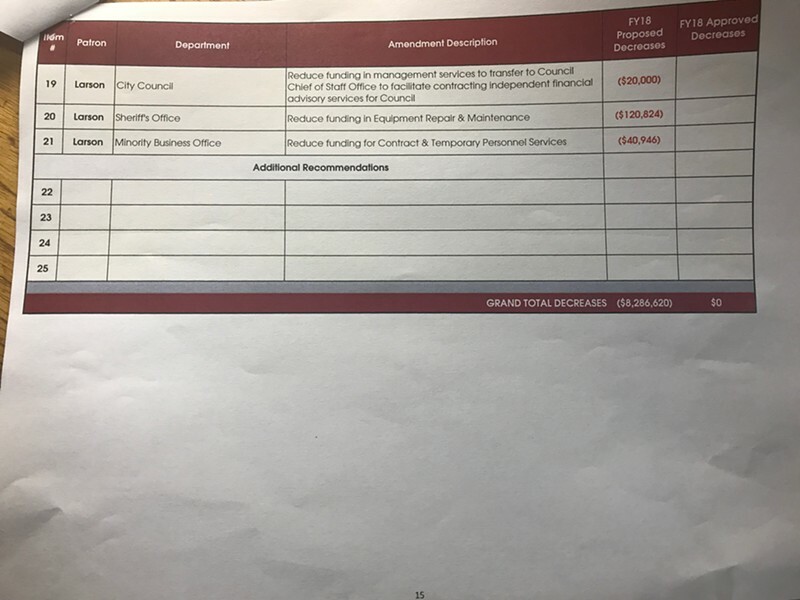 The packet of amendments handed out to the public did not list which City Council members proposed which cuts in funding. This photo shows page one of a version that does. Page two of proposed cuts to the mayor's budget listing the patron of each cut.